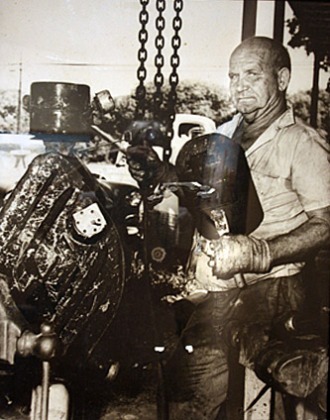 At the age of 34, Stanley Joseph Papio settled on the island of Key Largo and opened his own welding business. Canadian by birth, he had wandered all over the United States, drifting in and out of jobs, finally purchasing a small lot alongside U.S. Route 1. To the locals he was known as 'Barefoot Stanley' because he rarely wore shoes. His justification was that in his business, welding sparks ruined his shoes and it was cheaper to get used to burned feet than to continue buying shoes. Papio's welding business evolved into one of the most unique forms of metalwork art in the United States. He encouraged people to leave their old cars and appliances on his land so he could use the metal in his welding. 'A bunch of junk is a welder's glory. Buying new stuff is not a welder's way,' he said. Papio did not see junk - he saw art. Stanley Papio was born in Canada, but spent most of his early life in Illinois. He was a welder in the U.S. Army during World War II, and then worked odd jobs across the United States, including amateur boxing and wrestling, before he settled in Key Largo in 1949. Although he came to Florida as a horse groom, his favorite job was welding, so he purchased a tiny lot on U.S. Route 1 at Mile Marker 101 and went into business as a welder. 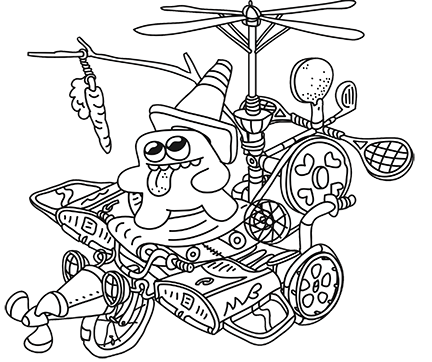 Papio encouraged people to leave old cars, washing machines and dishwashers in his yard, In those early years, no one cared that he filled his front yard with junk. The Upper Keys had not yet been discovered by tourists, and Papio’s nearest neighbor lived 15 miles away. Soon, however, encroaching developers, condominiums, neighbors and local zoning laws opposed his collection of junk. Neighbors complained about the eyesore, claiming his yard display was against the law. No one cared that Papio had been there first. The town hounded him to remove the junk and bring his property up to code. He refused to comply, instead he created sculptures welded together from his treasured junk and displayed them in his front yard. The mess of keeping these large pieces in his yard infuriated his neighbors - they often had him arrested for zoning violations. Papio fought back, however, and continued to breathe life into old junk. His world became one of satire and junk sculpture, some comical and many of pure venom aimed at neighbors and government bodies. He gave his sculptures caustic names such as The Two-Faced Woman and Greedy Grit the Contractor. He also renamed his welding shop 'Stanley's Art Museum,' and charged 25¢ admission. 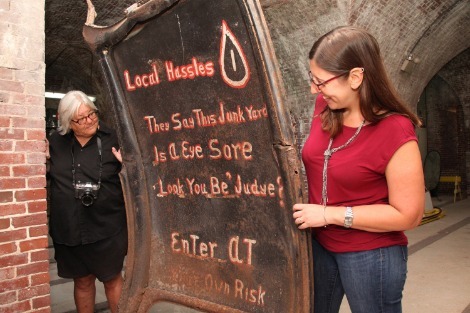 He thus created a roadside exhibition of folk art for travelers. Art fans regularly arrived to browse his creations and travel tours began adding his 'museum' to their itinerary. Before his death in 1982, Papio had achieved a certain amount of fame. Private collectors, museum experts and art critics began to flood to his yard. He exhibited his work in Ottawa, Canada and was once offered $7,000 by a museum for a sculpture. 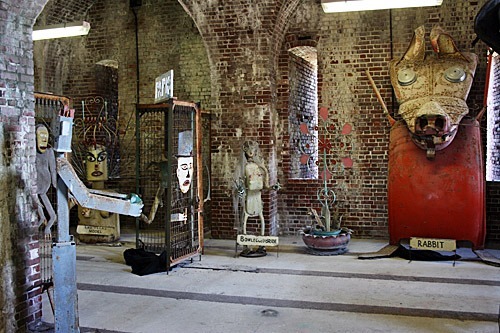 Three of his creations, W.C. Fields, The Monk and The Alligator toured Europe in 1981 as part of the U.S. State Department's America Now exhibition. 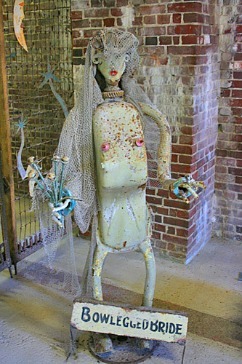 He was also listed in the Directory of American Folk Art and The World Encyclopedia of Naive Art. He had plans to build a trailer and take his work on a traveling tour of the country, but that was not to be. He died suddenly of a heart attack at age 67. Papio's family chose to donate his work to the Key West Art & Historical Society in order for it to be preserved for future generations. The Society's Fort East Martello Museum exhibits more than 100 sculptural objects and other three-dimensional constructions by Papio. 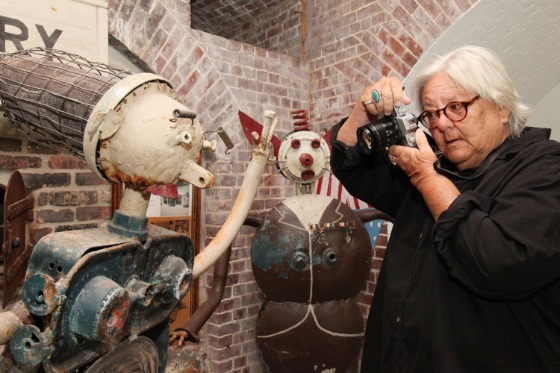 ​Historian and photographer Sharon Wells documents a pair of Stanley Papio sculptures, “The Water-skier” (left) and “World War I Doughboy” (right) at Fort East Martello. Wells was instrumental in facilitating the acquisition of more than 100 of the rebel artist’s works by the Key West Art & Historical Society. 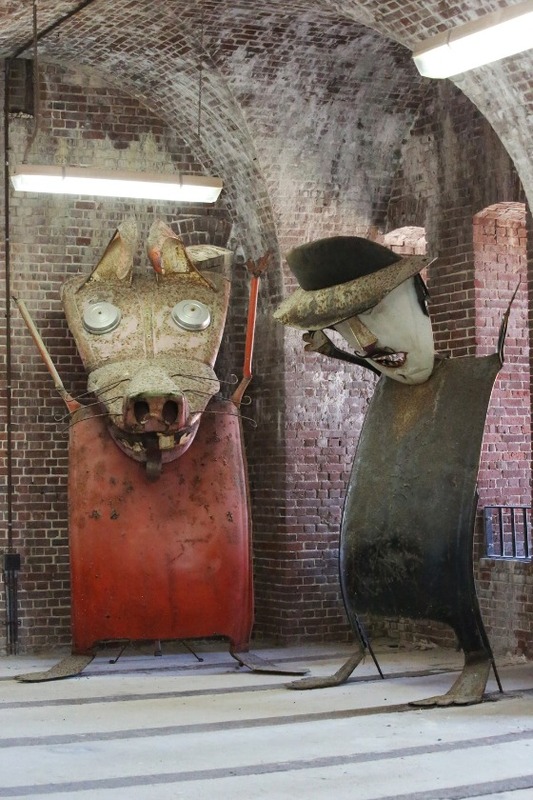 ​Two towering Stanley Papio sculptures –“The Rabbit” (left) and “The Preacher” (right) — that inhabit the Citadel at Fort East Martello appear to engage in animated communication.